Daddy has been away for a week and we missed him so much.... We talked to him every night and LZ want to say good night to daddy. Whenever I picked them up from classes, he asked "daddy in the car? ", "daddy is back?". L or me have to explain to him. Are you far far away? I was very upset with him... While I was cooking dinner, he came in and asked for a toy/fix a toy. 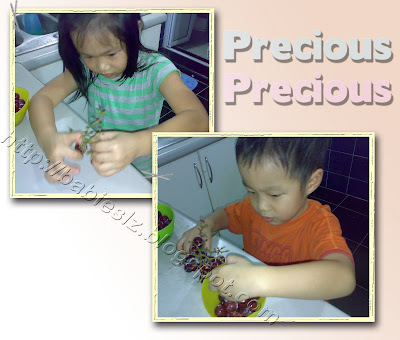 I told him that I was busy cooking and will help him later and he can ask jiejie to help him. You know what he said? Z :"Hm! You are not my mommy! You never do it!" It is so hurting.... My little boy said that to me... I stared at him in disbelieved and continued with my cooking. He was still standing there and knew he said something bad. He was quick to apologise but he has hurt me.... I stopped my cooking and talked to him. I told him he hurt me and I was very sad. He came forward, kissed and hugged me (one of the things I love abt him is that he is always quick to sense that he did something wrong and will apologise without prompting). me: I am very sad.. How can you say that to me? With that said little face, followed by a sweetest smile, how not to forgive him? Anyway, Let's talk about happy thing. 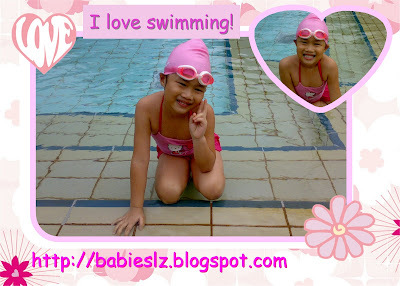 What does Z do when Jiejie having her swimming lesson? Sometimes, when I'm not lazy, I will let him have fun at the baby pool or play his toy cars/gameboy while waiting. Whenever I tell him that he will be dipping in the pool, he will get all excited! I am usually very busy on the day that L go for swimming coz I need to cook dinner earlier and pack it along so that he can have his dinner there. I cleaned the house and baked cookies on L's request. She asked if I can bake some for her teachers from the church. 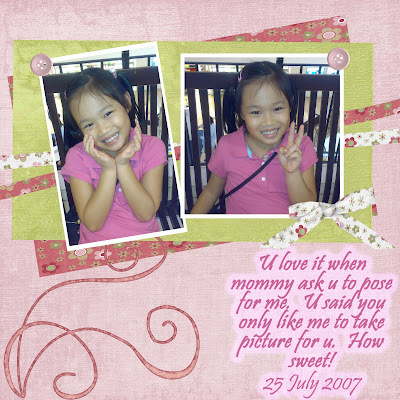 That was so sweet of her :) How can I say no to her? After making 1 batch of the cookies, I decided to make another batch. Ya.... I washed the things twice! Silly me! I should have make 2 batches at 1 go! Today, LZ happily gave out the cookies to all the teachers/helpers at the church. 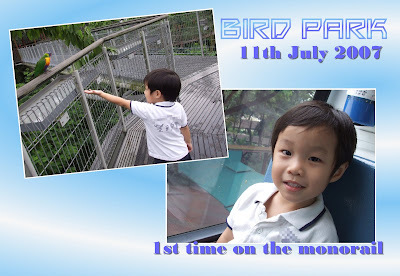 Actually, Z gave out only 1 pack, which was for his teacher and he ran off to exchange gifts with the coupons. L gave out the rest. I have prepared 20 packs and all was given out. It was a hit! 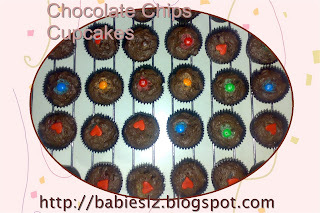 If you have time, do try out the cookies :) Recipe from here. -Set your oven temperature to 180 degree celcius. -Cream together butter and sugars until smooth. Add egg and vanilla and blend in. -Mix the rest of the dry ingredients. Stir in chocolate chunks. -Drop cookie dough onto a greased baking sheet and bake for 8-10 minutes or until golden brown. Majority of the parents chose Wednesday for the lesson... As LZ have other lessons throughout the week, teacher K said she would try to arrange another teacher to take her for the extra lesson during weekends. I asked if L can't make it for the extra lessons, would she be able to go for the exam. Teacher K said she still can go for the exam but would prefer her to attend extra lessons. I took this opportunity to ask Teacher how was L's performance and she said L is doing well except that sometimes she is playful at times. Back to the class, L told me she was very nervous before the class starts. 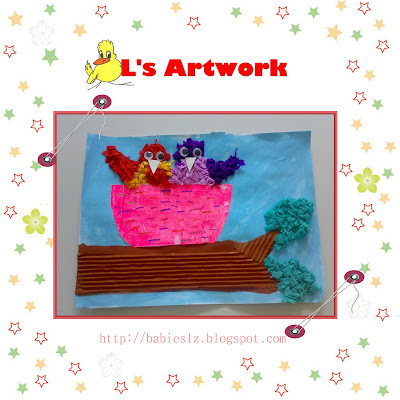 L : mommy, I am very nervous. L : Because there will be other people watching us. I'm so nervous! Me : Don't worry, this is going to be your usual lesson. Must be confident ok? Beginning of the lesson, she was not smiling at all and was very serious. Then she warmed up and was back to her usual self . I enjoyed watching her doing all the ballet movement :) Z went in too and he was playing with 2 Gameboy. He started to feel restless halfway but I managed to pacify him. On second thought, he looks good now. U think so? After parking the car, I tried to remove the key but it wouldn't come out. I was tired and LZ hands were full of chocolates, all I want to do is to get home fast. I tried and tried.... Look around and thought nothing was wrong. Then I approached one of our neighbours and asked if he could help. We tried pulling out the key but to no avail! Then he saw that my gear was not at P! What an embarrassing moment! I wished that I was more thorough in checking what was wrong. To make matter worst, LZ started teasing me! "Mommy, so embarrassing! Can't take out the key! Hahaha....." They continued till we reached our doorstep! When we reached home, daddy called. They happily told daddy what had happen, which I had no plan of telling him at all! Lucky the connection wasn't good so I think he missed it. Hope he will not ask abt it tonight when he call again. Pic taken this morning, 25 July 2007. I always hear both of them laughing. Be it on the way to school, at home or even in the shower. Every morning, I will have 2 smiley babies greeting me and it is definitely a great start for the day. Daddy took this pic on 14 July 2007 and I can't resist posting it here :) I remembered they were chatting happily while I was mopping the floor. I would like to present this award to many mommies out there but I can only give it to 3 mommies. Elaine - She is one amazing mom who cook yummy food for her family. I tried many of her wonderful recipes and you should check out her blogs too. I love the way she present her food to her little ones. MamaTang - When I feel like eating out, I will definitely check out her blog as she has many recommendation. It has been more than half year (since January) since she started her lessons with 3 of her friends. Before that, she had her lessons for 1+ yr when she was in childcare. It was a big group then with most of her classmates. Now that the group size is smaller, she is picking up very fast. L and me attended 1 of her classmates, Erika's party. While she was having fun at the gym, few of the mommies and me went for coffee. We had so much to talk about for that 2 hours and of coz we talked abt P1 stuffs too. I have to praise my little princess. When we go back to the party to pick up our children, the party was still going on. The host has a pinata and all the kids were given a bag to collect their candies. 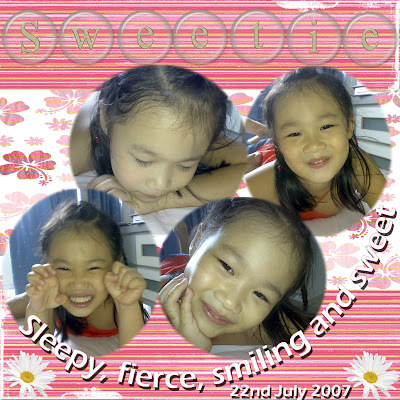 When she came back to me, she was holding 2 bags of candies. I asked her :" Why are you having 2 bags?" I thought she was greedy..... How wrong I was! She said :" This princess bag for me and Bob the Builder bag for Didi." Ohhhhh.... That was so sweet of her! The other mommies saw and praised her too. They said none of their kids thought of their siblings when they go to a party. When didi woke up from his nap (@ home), L happily handed the bag of candies to her bro and he said thank you. Then she opened her present from the party and was hoping to share it with Z but it was princess stuffs. She looked disappointed and said :" Didi, I can't share the presents with you. See? This is all princess things." 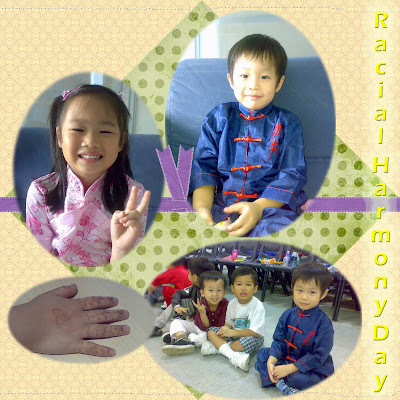 The school celebrated Racial Harmony Day and most of the children were dressed in their traditional costumes. L was told to talk about a traditional dish. She asked what kind of traditional dish does Hokkien has. Daddy suggested Hokkien fried noodle and wrote a list of ingredients and method for her to present to the class. She told me she was very nervous while doing the presentation but she managed. Teachers praised her for a job well done. I asked her if anyone else did the presentation and she said she was the only one. Hmmm.... This was not the 1st time she did what the teachers asked her to and she was the only one that follows. I think I better check with the teachers. Z was very proud to wear his Chinese costume. The weather was hot but he didn't complain! The class celebrated Maxx's birthday too. I asked him if he would share the goodie bag with jiejie and he said yes. As you know the registration for P1 is going on. Mommies that I meet during their enrichment classes or calls that I'm getting are talking about the registration. Even when I go to the supermarket or while walking home, I met some of them. My neighbours asked too! Someone : So how? Your girl P1 next year right? Someone: So which school your girl going? L : Mommy, which school am I going? Me : I don't know.... We will know by August. L : But why my classmates know where they are going? Me : Most of your classmates have older siblings, so they will go to their gorgor and jiejie's school. For you, you are older then didi so you will know later (silly answer right?). We need to take turn to register. See? Even the kids are talking about it! L : Mommy, you know we have a group in class? Me : Oh! Interesting! So all of you are best friends in class? L : We are the bestest friends! Amanda said I am the older sister. I take care of them. Me : You the older sister? But you are born in December. L : I don't know why. I think I know why. She is the tallest among them. Me : Do you play or talk with this few girls only? How about the rest? The 'sisters' don't go around bullying others, it is their way of having fun :) I met all of them and they are fans of Winx Club so they decided to form a group like them. 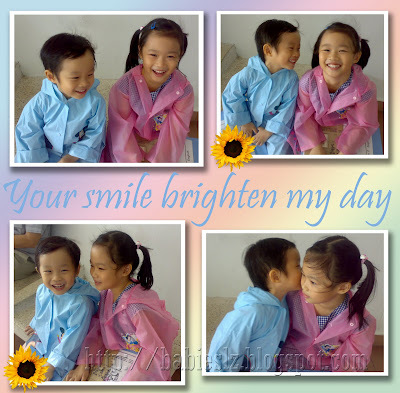 She may be in the new school for half year but I am glad she get along so well with her new friends. When I told daddy about her having group in school, daddy replied :" Wa! So young form group? 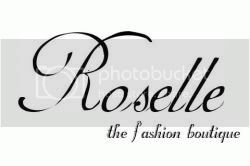 Gangster huh?" Tag : SAHM or FTWM? If you are given a choice, SAHM or FTWM? Give at least 3 reasons. - Include your name in the thread below. Without doubt, I have always want to be a SAHM. I'm glad hubby love it too and he is always proud to tell his friends that I am a SAHM :) My relatives and friends were surprised that I am SAHM. I want to be with them every moments of their lives. I don't want to miss out anything abt them. They grow so fast! I don't trust anyone taking care of them and I can't bear to let someone else take care of them. I love to cook and bake for them. The joy of seeing them enjoying the food make my day! Immomsdaughter prefers to be a SAHM. Miche prefers to be a SAHM. Msau prefers to be a PTWM. Everydayhealy prefers to be a SAHM. Cheryl prefers to be FTWM but will consider SAHM. Mom of Cairo prefers to be PTWM. Jean’s Diary prefers to be a SAHM. BabiesLZ prefers to be a SAHM. Me : That is because I do lots of housework. L : Poor mommy.... My hands are rough too! Me : Nonsense! How can your hands be rough? I put lotion for you before bedtime and you don't do housework. L : I do housework. I sweep the floor, pack up the toys and I sometimes wash the cups. Me : But you don't mop the floor, wash the toilets or the clothes. L : Ya.... So next time ask daddy to do it. I can help you too. *_* My dear girl, daddy has to work and I take care of both of you and the house :) When you go to primary school, you help mommy whenever you can ok? 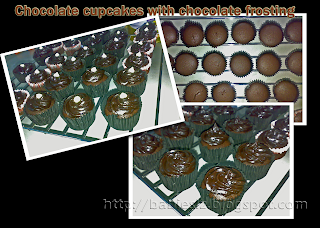 LZ love cupcakes and I love to bake for them. This weekend, I baked another batch of it :) They looked so plain so I added some frosting and white chocolate chips on top of it. This was the 1st time I cut Z's hair. For L, I had only trim her fringe. Since we are not going out this weekend, I thought why not give it a try and when he is older, I'm sure he wouldn't allow me to do that. If it is a failure, nobody would notice or laugh at him and at leasrt I tried. When I asked him, he happily said ok. So we went to toilet with a stool and then I snip snip snip! He wasn't wearing any T-shirt nor a towel to cover his body. He started complaining hair over his body, his face and on his lap. During the session, L was there giggling and helping to coax the brother. Z : Mommy, are you done? Z : Mommy, are you done? Why take so long? Very itchy! Me : Soon.... See? Mommy yet to cut this side and it is longer than the other side. You want to look handsome right? Z : OK.... Can you hurry up please? Z : Mommy, are you done? I don't want to be handsome. Very itchy! Me : Ok ok..... Finishing soon.... Please let me finish it. Let me rinse for you first then you will feel better. Me : Can mommy cut your hair again? Me : Why? 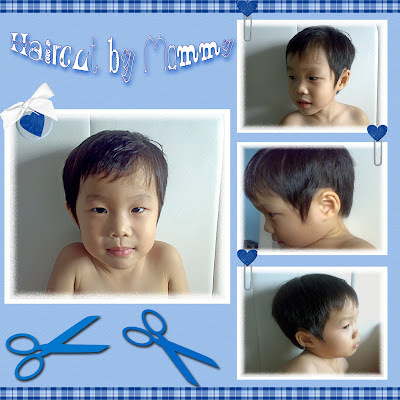 Mommy likes to cut your hair. I had fun! (I love to tease him) Can I cut 2 more times please? Z (he put his hand under his chin and think) : One more time ok mommy? Just 1 time only. Me : C'mon.... Look at you now, don't you think you are very handsome? And I can't cut jiejie's hair, she wants to keep it long. Me : Thank you! The next time, you will wear your clothes and you will feel more comfortable. My boy does give in to me too. Hehehe.... I better treasure the 2 chances that he is giving me ;) Maybe this will be the one and only time that I'm cutting his hair. I was nagging at them for messing the place while sweeping the floor. LZ decided they want to help too. Quite some time back, L spoilt her school file and I told her she has to work to pay for her new file. Then she fell ill and I forgot abt it. Today I thought was a good time for her to "pay" me back. Hahaha.... All this time whenever they offered to help me out (sweeping the floor), I told them no. Not that I don't want them to do housework, it just that they have been working hard on their school work and enrichment classes. I would rather they relax when they are at home. They were very serious while sweeping the floor, telling me to stay clear :) I told them I would pay each $1 for a job well done and LZ were so happy. They probably think that there wasn't enough "dirt" on the floor so they decided to "dirty" it by throwing the beans (from their craftwork) all over the place! I wished I can go with L too, then I can spend some time with her and see how she get along with her friends.... Nevertheless, she told me she enjoyed the trip. How careless I am! I misread the timing for her mini concert and I missed it! The concert usually starts 15 mins before class ends and I take it for granted it will be the same. I walked into the classroom 15 mins late (not knowing that I was late) and was wondering why those parents are sitting down and doing some worksheets with the kids. I thought they will have the concert later. Then I realised through the teacher that we were supposed to arrive half hour before the class ends instead of 15 mins. L was happy to see me and asked why I did not come in earlier to see her performance. Teacher told me that she was looking at the entrance throughout the performance, hoping to see mommy walk through that door. When I heard that, I felt so bad. How could I missed it? I hated myself for not reading the notice again. I'm soooo sorry Sweetie.... Mommy will not missed it again. When they are in school, I used to spend my time doing chores or shopping or napping but nowadays, I spend more time sitting in front of the computer. We used to have 1 computer at home and I have to share/"fight" with 2 little kids & 1 big kid. Now, my 2 little ones have their own computer and it's free! I can't leave without my camera HP. I take lots of pics with it and will post it on this blog. 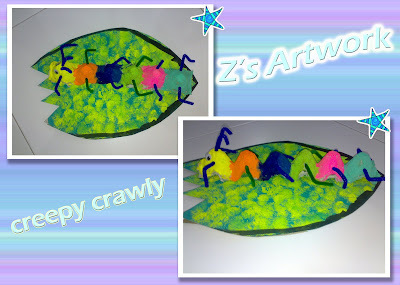 LZ is very excited to see what I post on their blog so I take more pics and video clips. I used to write diary for both (individual). Now that they have a blog, I can combine it and I can write more! We made the right choice! They have a wide selection besides mushrooms. The soup base was great and the appetizer, Wild Mushrooms With Thai Spices (sliced wild mushrooms seasoned with Thai spices and served at room temperature) too. You should also try their House Specialty : Monkey Head Mushrooms With House Dressing (lightly fried monkey head mushrooms tossed with walnuts and in-house dressing). We enjoyed the food and the service was excellent AND the LZ eat for free! This promotion (kids eat for free, 1 for 1) ends on 31st August. Z : Jiejie, let me see! Let me see! Z : Please let me see! Z : I don't laugh at you ok? Pleaseeeee! Jiejie, let me see! L : You will laugh at me. NO! 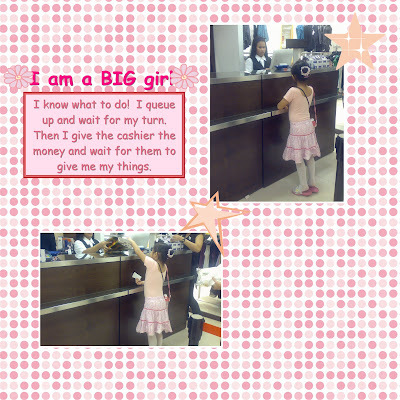 Picture of L making payment for her scarf :) She needed one for her ballet and we found one at the store. She happily went to the counter to make the payment. How it all started.... We went for the show, "Surf Up" and Z saw the Fantastic 4 postcard. He gave it to godma and she promised to send it to him. Godpa was going to Australia for business trip and he sent 2 cards to them from Australia and there were koala stamps on them. 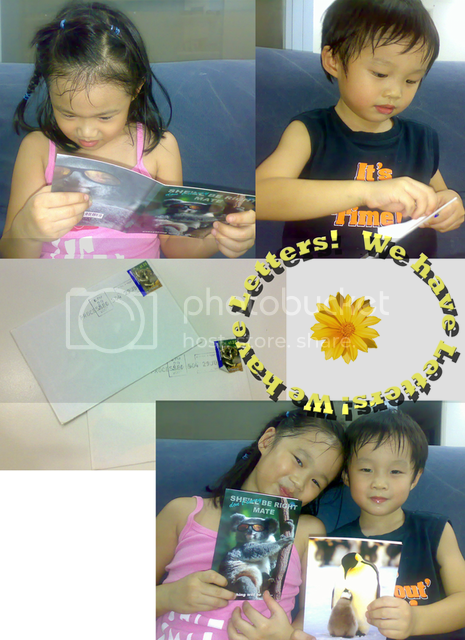 They decided that they want to keep the stamps too! Thank you for making them so happy! Okay, so you're slightly vain from time to time, but you're not superficial at all. You are realistic. You know that looks matter. You just try to make them matter less. I use daily cleanser that you can find it any supermarket /Watson . Makeup : minimal, Eye brow & Sunblock (I have to put it on everyday since I walk with the kids to school). Unless I have party or function to attend, then I will put on foundation, blusher and lipstick. Astee, Jean and Mom to Angels, would you like to do this tag? When one does homework, the other will follows. Jiejie usually spend longer time as she has more homework, then Z will be there playing with his toys and waiting for jiejie to join him. They like to playing hide & seek and catching in the house! They fight to be the first to tell me who is the one that did the naughty stuffs. They play every time when they shower. We have black tiles in the toilet, so they use the foams to "draw"on the walls. She called me few days and as usual, we talked for more than an hour. Plus, I get to see Justin in action! He is sooo adorable! He loves the VCDs that I sent and to prove it, Cousin played the VCD while we were chatting. I saw how he moved to the music. Sooo cute!